Successfully Added Portable 500GB External HDD for Mobile Storage Solutions to your Shopping Cart. 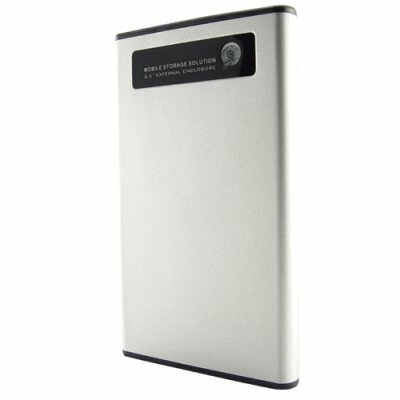 Portable 500GB external HDD for mobile storage solutions. The CVIG-E29 provides high capacity storage and fast transfer rate to let you conveniently move and copy files with speed. This slim line external HDD is built with a durable polished aluminum casing, and provided with a black colored fashionable case, along with a USB 2.0 cable which simple makes this unit ready you use the second you take it out of the box. Computer accessories can be bulky and make your laptop bag super heavy. This ladies and gentlemen is the mobile storage solution you've all been waiting for. Completely flexible in its use, which only requires a USB connection to power on. So whether your at home on your desktop or on the go with your laptop, you cannot argue what this 500GB of additional storage space can do for you. We all know how laptop accessories can be bulky and heavy to carry around in your laptop bag! Well, with 500GB of storage space for work files, presentations, media files, movies, downloads, music etc, makes this top or the range truly a perfect solution for workaholics and media orientated individuals. This is also a very useful item for both business travelers and college students. This brilliant HHD external storage solution with 500GB capacity is available in stock now for single or bulk purchases. So login today and get one for personal/company use, resale market or online/physical store, from the leader in factory direct wholesale electronics, Chinavasion. Ultra portable 500GB SATA HDD. Provided with a slick looking designer bag in black color. All metal casing provides secure and cool operating environment for the hard disk. Use the SATA 500GB hard disk to transfer or backup your files, with only one simple USB connection to your Laptop, this allows for a more practical usage. The collective aspects such as performance, design, durability, casing and quick file transfer, all being attended to perfection with the user in mind, positions this 500GB hard drive as a top seller. Get the CVIG-E29 today as gift or for your own personal use to back-up all your videos and wonderful memories so that they will last forever. I connected the 500Gb external HDD, but nothing happens? Make sure the USB connection has sufficient power. The external HDD will work on both USB 2.0 and 1.0, but for USB 1.0 ports the HDD will take a few seconds to be recognized. VERY Cool !!! BEST BYE!! Recomendation! !